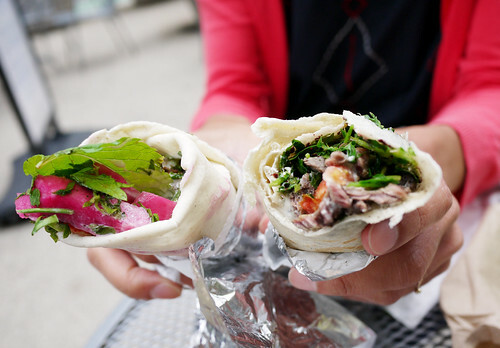 In brief: The cutest little take out joint across from the Flatiron Building manages to serve innovative Middle Eastern at very reasonable prices. And they make a killer mint lemonade. Shame on us for not trying the takeout joint from Ilili before, but it was the right temperature out today and we were in the right mood. M. tried the falafel which she liked and I had a lamb shawarma which is only good if you happen to love parsley. I'm don't mind parsley but I'm not a fan of it in overwhelming quantities. We both adored the mint lemonade, just the right amounts of tart and sweet. I just went a few days ago and loooovved the fattoush salad i had. Super flavorful and hearty enough for a lunch. I'll be back soon for that falafel!